iTunes U has a new feature allowing instructors to create and distribute complete courses featuring audio, video, books, and other content. Students and lifelong learners can experience these courses for free using the iTunes U app for iPad, iPhone, and iPod touch. 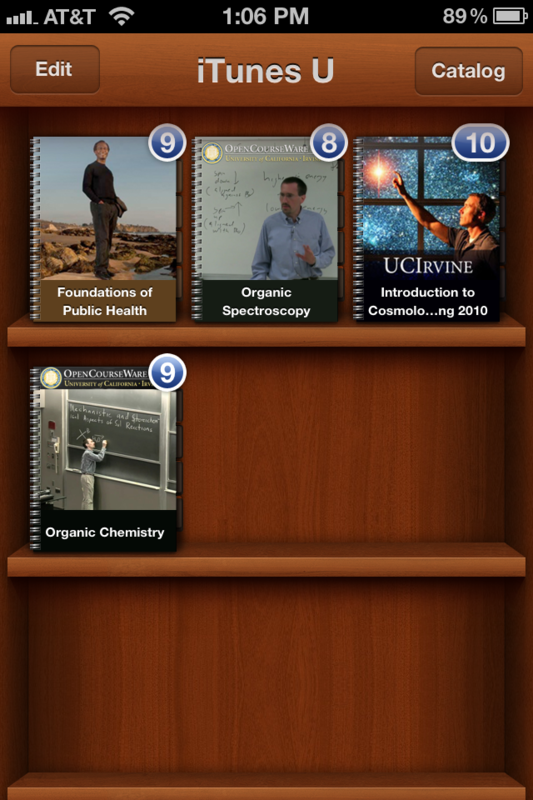 The iTunes U app gives students access to all the course material in one place. They can play audio, video, read books and view presentations. They can also see a list of all the assignments for the course and check them off once complete. Instructors use iTunes U Course Manager, a web based tool, to gather all the materials to create the course. To learn more and create your own courses on iTunes U, please see our iTunes U for Content Providers page. 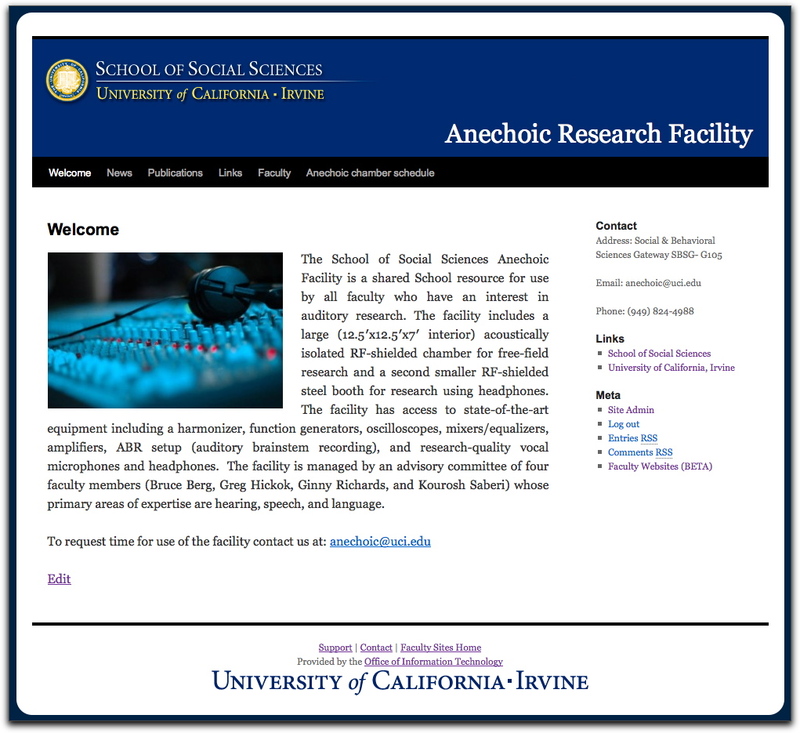 Faculty Websites is a service provided by the Office of Information Technology in collaboration with the academic units. 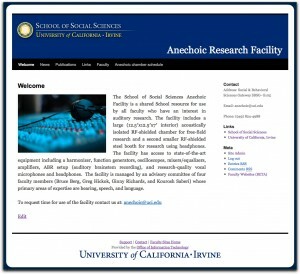 Our goal is to enable UCI Faculty to create a website for themselves or their research lab easily. We are using WordPress, the same technology that runs our Sites@UCI service. We have customized the Faculty Websites service to make it quick and easy for faculty members to create a website using templates – sample pages ready to be edited. All content creation and editing is done through a web browser and requires no web-development experience. You can authorize other UCI people to help maintain your content. To see if this service is right for you, read about the benefits and limitations. If you would like to request a website, click the “Request a Website” button on the Faculty Websites homepage. 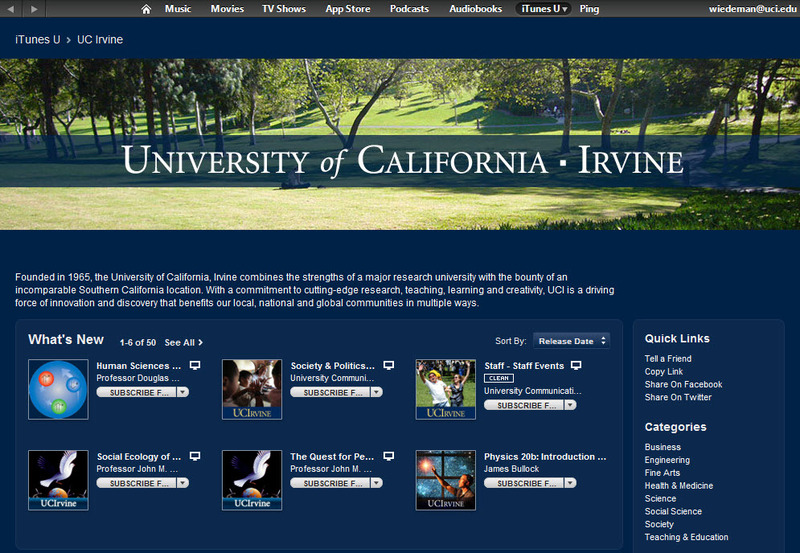 UC Irvine uses Apple’s iTunes U to make podcasts readily available to faculty, staff, and students. Using iTunes U, you can access course content and university information from within iTunes. To access UCI on iTunes U, you will need to have the latest version of iTunes installed on your Mac or PC computer. You can find UCI’s content in iTunes U by searching for “UC Irvine”, browsing Universities & Colleges, or using the direct link below. If you have podcasts that you would like to include in UCI’s iTunes U site, you can apply to become a contributor. There are some technical requirements including needing an Apple ID and the Safari web browser (4.0.3 or later). In most cases, your school’s IT support team is available to assist you in using iTunes U. OIT is also available to those who need advice or expertise beyond the experience of your local support staff. Detailed information is available at OIT’s page for iTunes U content providers. More general information can be found on OIT’s iTunes U FAQ.